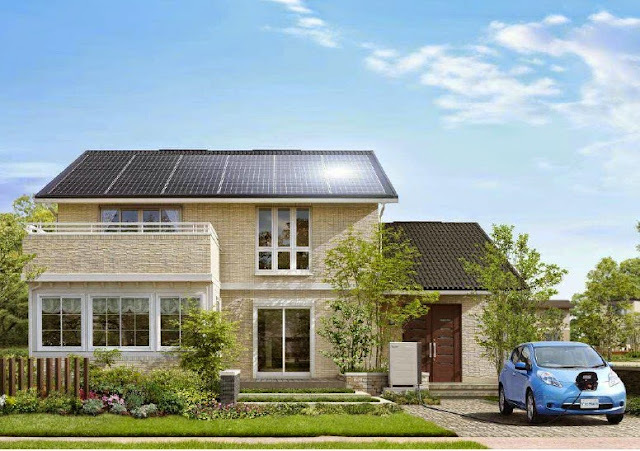 Sekisui Chemical have launched the "Grand Two U V to Heim," a wooden smart house that links an electric vehicle (Nissan Leaf) and a solar power generation system with an output capacity of 10kW in the aim of realizing practical energy self-sufficiency. By appropriately controlling a solar power generation system and the rechargeable battery of an EV, the system is able to provide up to 75% of the amount of electricity consumed by the entire house throughout the year. Conventional "V2H" systems, which provide electricity from an EV to a house, have various limitations. For example, when electricity is supplied from an EV to a house, it is necessary to temporarily cut off electricity from the power grid. To solve this issue, the Grand Two U V to Heim comes with a grid connection system that also controls an EV and a solar power generation system.